On my hands and knees, I dig. Gray leaves crumble under my trowel’s blade. Every few pulls I wipe away the cold dirt clinging to the steel. Our youngest kids—our 11-year-old daughter and eight-year-old twin boys—stand in a semi-circle gazing down on me. The afternoon sun hangs low in the naked tree branches. We’re alone in a strip of Virginia forest. I’d found an online map that overlaid the Civil War Battle of Williamsburg against the modern roads and figured this empty land near a route into the battlefield might yield some remnant of war from 1862. Brandon Lingle spent time at Camp Speicher near Tikrit, Iraq in June 2011. Courtesy of Brandon Lingle. For as long as I can remember, I’ve searched for fragments of past conflict. As a child on a summer trip to Indiana I scoured the forest for arrowheads after a visit to Tippecanoe. On a rugged beach near my California hometown, I searched for the remains of U.S. Navy destroyers that ran aground there in 1923. As a teenager, my friends and I collected corroded machine-gun casings and grenade pins at the site of a mock village where soldiers trained during World War II. When our older boys were young, just eight or nine, we bushwhacked through the chaparral to gaze at the skeletal remains of a missile that had exploded in 1986. Later, they endured the Arizona summer heat as we spent hours walking around an aircraft scrapyard outside Tucson where I bought a fuel gauge from a B-57 bomber, the type of jet my uncle flew over Vietnam. In Colorado, I hiked to the wreckage of a World War II cargo plane that had slammed into a mountain above the Air Force Academy in 1943. In Iraq, I collected stories. 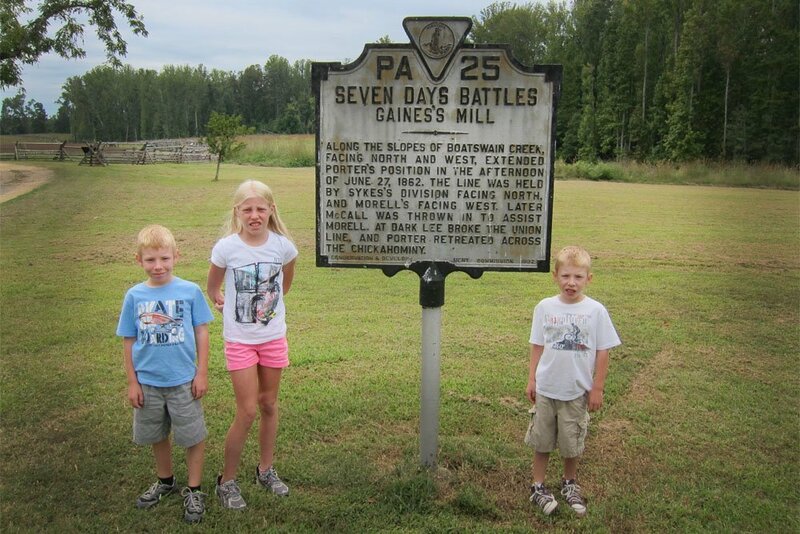 Brandon Lingle and his family explore Gaines’s Mill, part of the Seven Days Battles, Hanover County, VA. Courtesy of Brandon Lingle. “Not yet, bud. Almost there,” I say. Unease builds as the hole grows. I feel as if we’re trespassing. We’re well outside the national park boundaries, but I think the dread comes from someplace more sublime. It’s as if I’m seeking some truth that best remains veiled. Back from Iraq just a month, I’d promised my kids an adventure, a treasure hunt like Indiana Jones. I imagined some quality time outdoors embracing the bloody history of our neighborhood, but this isn’t turning out as I’d hoped. As military kids, they’ve endured moves every few years and experienced me leaving for long periods. They’ve visited countless battlefields, monuments, and war museums. We’d been at war for their entire lives. They knew more about the costs than I did at their age, and looking back I realize they probably didn’t want to spend another afternoon around the violence of the past. 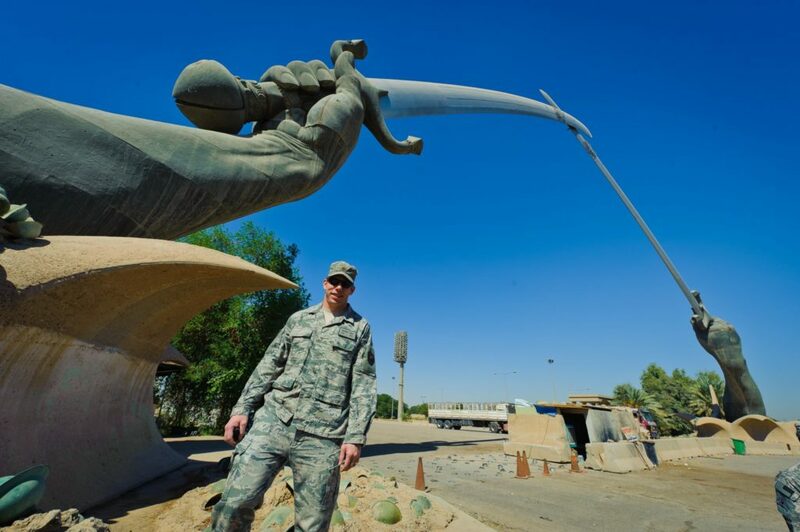 Brandon Lingle stands beneath the Swords of Qādisiyyah in Baghdad, Iraq. Courtesy of Brandon Lingle. Moisture seeps through my camouflaged pant knees. I stand, pick up the cheap metal detector, and pass the disc back and forth over the shallow hole. The machine beeps at the same spot with each swing. The buzz echoes too loud in the still winter forest, and I turn the knob to quiet the noise. I continue digging. I look up at my kids bathed in the pale light and think about how they never say they’re scared. One Saturday night we watched Rise of the Planet of the Apes. And, just as Caesar and his comrades rise up to break free from the primate facility, the twins stood; one said, “It’s late. We need to go to bed.” But it wasn’t late, and most children don’t voluntarily go to bed. 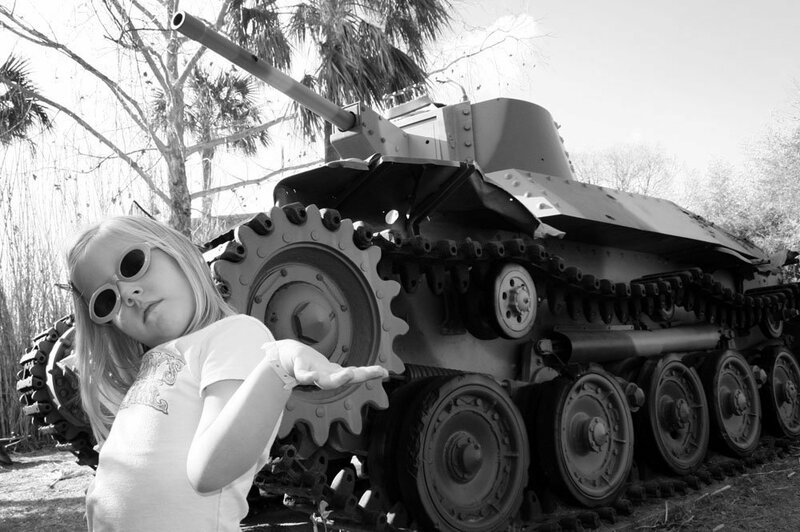 Battlefields of yesteryear transform into playgrounds of today. 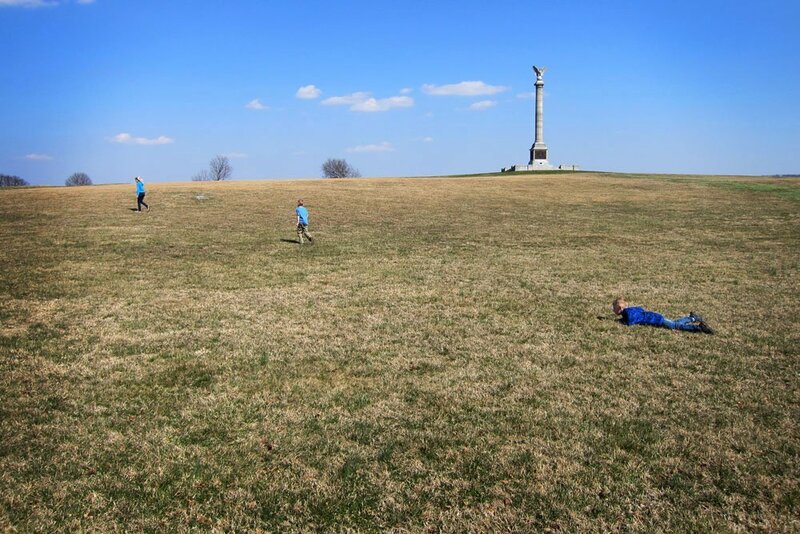 The Lingle Family explores near the Antietam battlefield near Sharpsburg, MD. Photo courtesy of Brandon Lingle. They won’t meet my eyes now. They glance beyond me, over me, to their left and right. They shuffle feet, jam hands in coat pockets, and cross arms. “I’m cold,” one of the boys says. “I’m hungry,” says the other. More than 3,000 men ended up dead, wounded or missing throughout these dormant woods 150 years ago. In that moment I don’t speak of their ghosts, and I’m not sure why I’m searching for war shortly after coming home from one. We hadn’t talked much about Iraq after I returned. I brought them Iraqi dollars and frayed patches. I gave my daughter a vintage brass genie lamp and Iraqi jewelry. For the boys, I offered Operation Iraqi Freedom t-shirts and lucite keychains with black scorpions and the word “Iraq” suspended inside. Someday I’ll give them the broken blue tiles I found in a sand-filled swimming pool on a base outside Tikrit, near Saddam Hussein’s hometown. 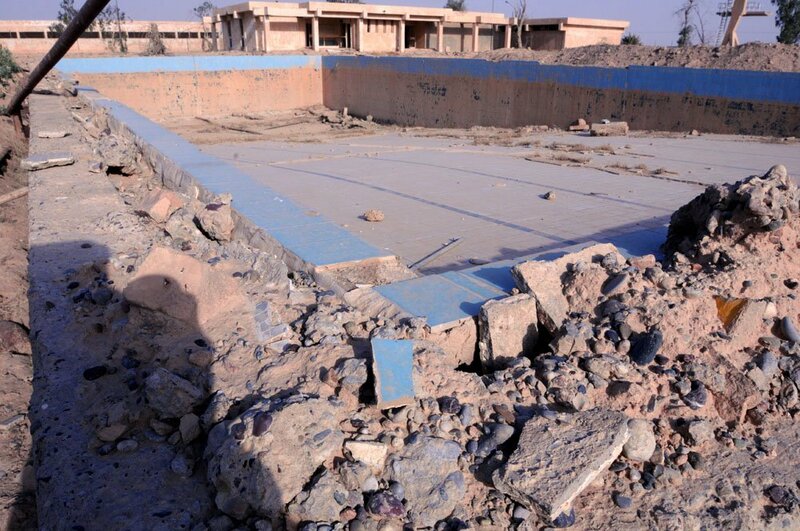 My story will go that the pool tiles came from Saddam’s pool, but there’s no way to know if he’d ever been there. 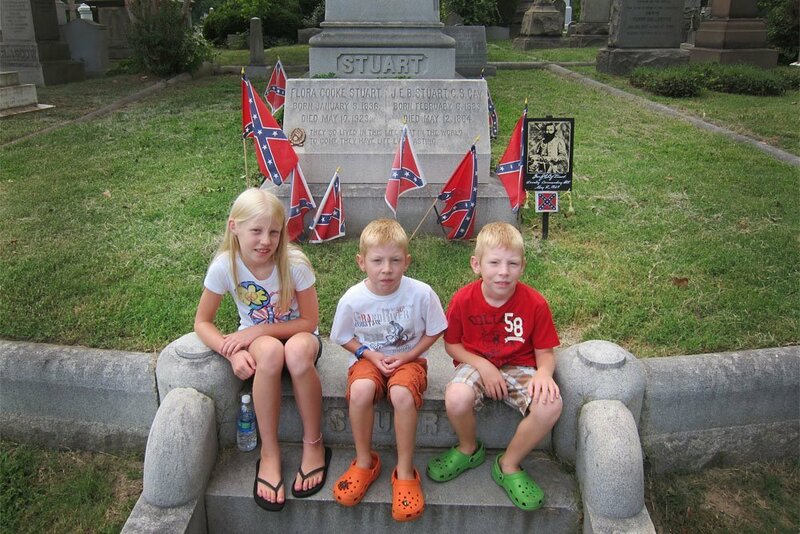 Brandon Lingle photographs his children near General J.E.B. Stuart’s grave in Hollywood Cemetery, Richmond, VA. Courtesy of Brandon Lingle. A foot into the earth the trowel catches and we hear the dry scrape of metal on metal. The earth muffles the sound that reminds me of a stick dragged on a sidewalk. I reach down deep and my fingers fumble around the object; I pull, and soon it breaks free. Still kneeling, I hold the four-inch mass and wipe away the dirt. The kids gather close and lean over me in a sort of family huddle. Their eyes lock on the object, and they wait for revelation. The mass we found in the Virginia soil is some kind of swivel hook with a loop where a strap could have attached. The warped and rusted steel feels heavier than it looks. I tell the kids the piece may have fallen off a cavalryman’s horse, a cannon, or a crate, but I have no idea. 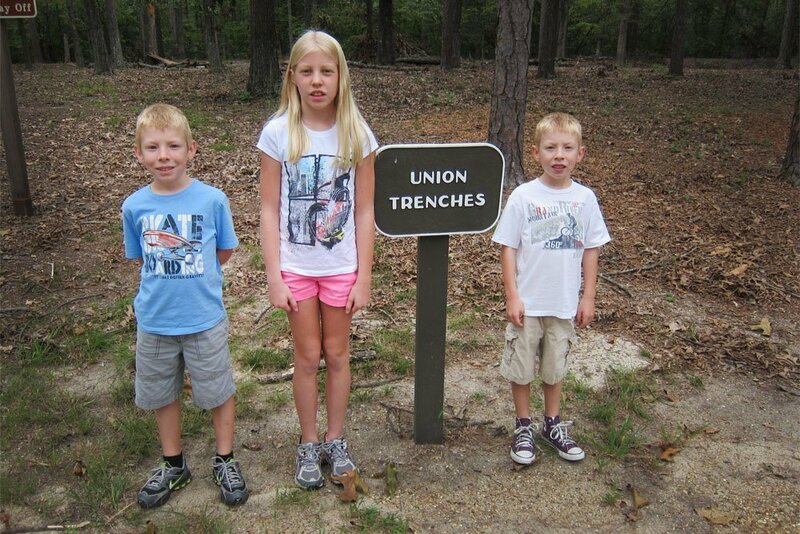 The Lingle Family explores Union trenches at Cold Harbor, Hanover County, VA. Courtesy of Brandon Lingle. I shroud the artifact in an old rag from my pocket, and my kids help push dirt into the hole. In this region, the oldest part of the United States, it’s hard not to think of old burials. We walk out of the woods together. Later, I spend hours researching the fragment. I examine books dedicated to Civil War equipment and hardware and never identify the artifact. Similar to the faded uniforms and boots in my closet the twisted debris carries the weight of war, but it’s hard to realize without a story. Today the unearthed hook rests with seashells, water-smoothed glass, and other flotsam we’ve collected together over the years. In a strawberry carton on a high shelf in our garage the relics offer quiet reminders as they gather dust together. AIRMAN. FATHER. WRITER. Brandon Lingle is completing a book about balancing fatherhood, family, and health crises amidst deployments to war. His essays have appeared or are forthcoming in The New York Times At War, The American Scholar, The Normal School, Guernica, The North American Review, and other publications. He’s served as a public affairs officer in Iraq and Afghanistan. He is an Air Force officer currently stationed in Texas. The views expressed here are those of the author and do not reflect the official policy or position of the United States Government, the Department of Defense or the Department of the Air Force.